24 x 27 cm  p. : chiefly col. ill.
Travel 20,000 years into the past and discover what life as a caveman was like in this prehistoric picture book by a prodigiously talented artist. 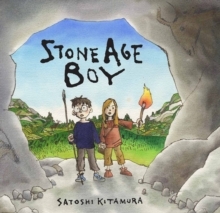 One day a little boy is walking along when he trips, stumbles and falls ... into the Stone Age! He meets a girl his own age and her tribe, and learns all about their way of life. He watches them make tools, clothes and weapons. He sees how they hunt, fish, cook, celebrate - and even how they paint on the walls of caves. But when a furious cave bear attacks, he wakes up back in his own time where everyone tells him it was only a dream.